Properly humidifying my guitars (40-50% relative humidity) helps them stay in tune and play the best, while keeping the wood from cracking. Over the years I have purchased and used several different room humidifiers to do the job. 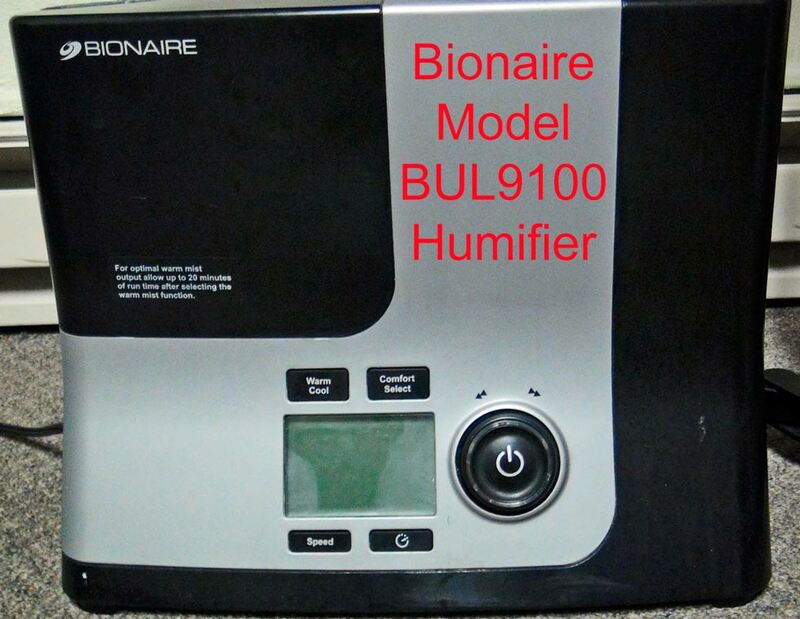 The best humidifier I have ever used is the Bionaire Model BUL9100. It has a humidistat that can be adjusted to automatically keep the humidity level in the room at the correct level. A guitar maker I know keeps the humidity in his shop at around 40%. My research over the years produced the same recommended level - somewhere between 40 and 50 percent. Keeping your guitar at this humidity level will keep the wood from drying out and cracking. It will also help it stay in tune while maintaining the conditions under which you should have originally set up your guitar (neck and bridge adjustments). After a couple of years of use, my Bionaire Model BUL9100 humidifier started leaking. After trying a couple of different things, I was able to repair it. It is now working like new. If you have the same model and are dismayed that it is leaking, the process described below may repair yours too. Before you go ahead and try the procedure described below to repair the water tank, I should note that I tried something else first. Although it didn't completely solve the leaking problem, it helped make the humidifier work like new again. Unfortunately I didn't take pictures while I disassembled it, so I can't give you a detailed description augmented with photos. But if you're reasonably handy with tools, taking things apart, and putting them back together, you should be able to do it yourself without much instruction. Before I repaired the water tank as described below, I completely disassembled the humidifier and cleaned it. (It's really an amazing piece of sophisticated engineering - a clever combination of electronics, rubber tubing, a heating element, and other parts.) If you decide to take it apart, make note of how everything fits together. There are several screws on the back and bottom of the unit that need to be loosened and removed using a Phillips screwdriver. Plus, you'll have to do a little detective work and trial-and-error to figure out how to completely disassemble everything. Once everything was taken apart, I found that several parts had become coated to various degrees with calcium deposits and other gunk. (Using pure water will probably limit this problem. Most tap water contains hard water deposits.) The transducer and surrounding areas were particularly dirty. I carefully cleaned everything and put the humidifier back together. To my chagrin, the humidifier worked better but it still leaked. The next step took care of the leaking problem. The last step in fixing my humidifier was to repair the water tank. 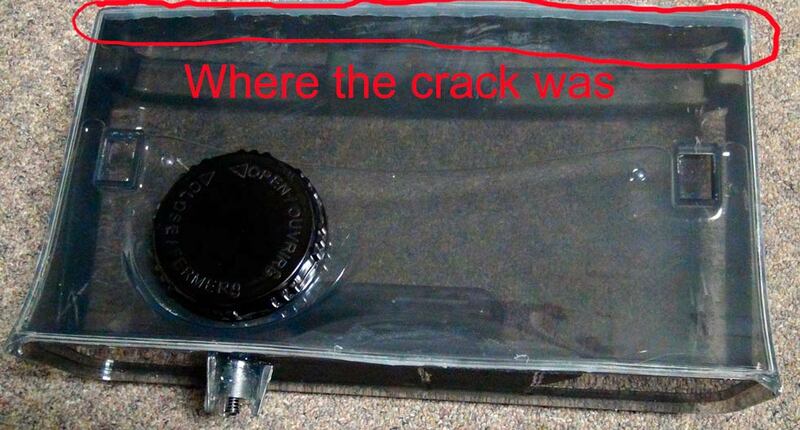 When I inspected the tank carefully, I noticed that it was cracked. If the tank is cracked, air will be able to enter it. Then the water will not stop draining from the tank when it is installed on the main unit, causing the unit to overflow. When I sealed the cracks and all of the seams on the tank, the leaking stopped. Step One: Get some silicone glue. I used GE Silicone II glue. Step Two: Drain the tank and thoroughly clean and dry the outside of it. Step Three: Apply glue to the areas that are cracked and the seams. Check out the pictures below to see where I applied the glue and what my water tank looked like when it was done. Step Four: Smooth the glue with something flat. Step Five: Let the glue dry. Step Six: Fill the water tank and attach it to the main unit. Step Seven: Rejoice that your Bionaire Model BUL9100 humidifier is again working like a top! I hope the process described above helps you repair your humidifier. Mine has been working great for several days now with no leaks. It is producing plenty of humidified air like it did when it was new. I use only water that has been purified through reverse osmosis. The local grocery store sells it in bulk for only 38 cents a gallon. When I first purchased the unit, I used ordinary tap water and was frustrated to find that it left a thin layer of dust everywhere. After doing some research, I learned that using ordinary tap water causes this problem because of the hard water deposits. Once I started using pure water it no longer left dust deposits. If you have any questions, feel free to send an email to jla@jlamusic.com.